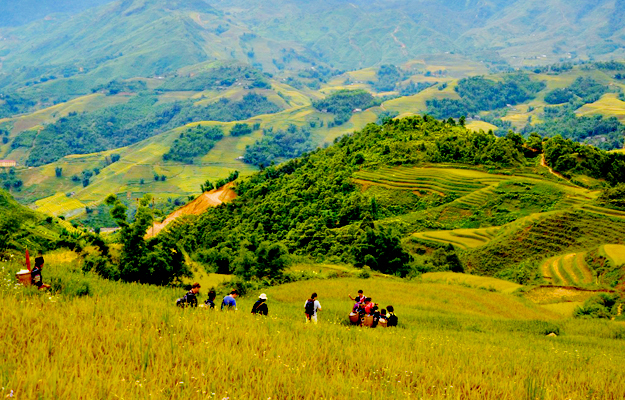 This tour gives a wonderful overview of Sapa, several picturesque minority villages, beautiful mountains and terraced rice paddies, and the amazing Bac Ha Market. You'll have plenty of opportunity to take in the lovely scenery and to interact with the local people while learning about their traditional way of life. 7:00 AM to 7:45 AM: Have breakfast at hotel, pack lightly for the 9-kilometer trek ahead. 8:00 AM: We'll take a short drive to Y Linh Ho, then trek through the rice terraces and along Muong Hoa Stream to the Black H'mong village of Lao Chai to see the spectacular landscape of Hoang Lien Son Mountain. In late afternoon, we'll approach Ta Van village where the Dzay ethnic people live. The 9-kilometer trek lasts for 4 hours. The bus will be waiting at Ta Van Bridge for the return to Sapa. 12:00 AM – Have lunch in Sapa and enjoy free time in the afternoon to discover Sapa town by yourself. Dinner and overnight in hotel. 6:15 AM to 7:00 AM: Have breakfast at hotel. Check out the room and bring all your luggage for the Bac Ha market. 7:00 AM to 14:00 PM: We'll drive 2.5 hours this morning to Bac Ha Town, the home of the Flower H’Mong ethnic minority market. Once in Bac Ha, explore the wonderfully colorful market, filled with Vietnam's most colorful ethnic minority people. Everything from carefully hand-woven clothing to livestock is sold here. We'll have lunch at a local restaurant, then walk a short distance to Hoang A Tuong's palace. This grand palace was built in 1914 by the French. We'll also visit the Pho Village of the Flower H'Mong people. We'll have a four-kilometer, two-hour trek. 14:00 PM: We'll take a 1.45-hour drive back to Lao Cai city, where you can have a shower, explore the temple or relax at the border crossing into China. We do not return to Sapa from here. 16:30 PM: We will now drive back to Hanoi, taking one comfort break along the way. 21:15 PM: We say goodbye to you at Hanoi Family Homestay.You are welcomed to shuttle bus back to Hanoi with one comfort break. - $168 USD per person for standard, 3-star hotel in Sapa ($195 USD per person if a 4-star hotel is desired). Single supplement: $30 USD for a standard hotel; $50 USD for superior hotel.